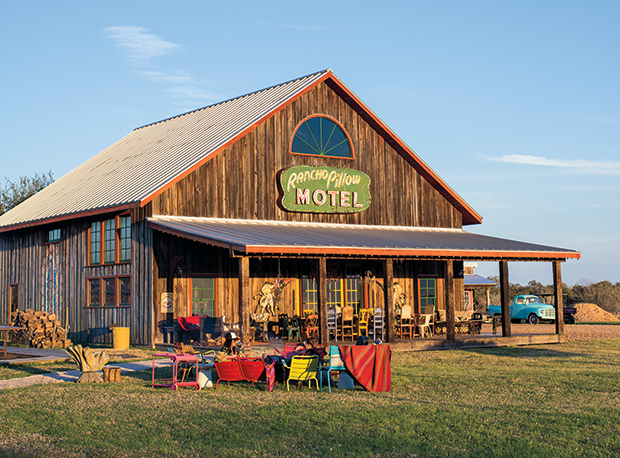 Eve’s Garden belongs to an unconventional breed of Texas hotels that continue to pop up across the state, winning over travelers with their novelty and sense of adventure. While these hotels may look a little different, they aren’t the result of hoteliers gone mad; their owners are forward-thinking Texans inspired to share their strange yet magical little corners of the world. Break free from hotel chains and escape to one of these eight locales for a truly memorable summer vacation. $185-$215/night. 200 NW Third St., Marathon. 432/386-4165. Kate Thayer, co-owner, artist, and creative force behind Eve’s Garden, entertains a particularly mesmerizing aesthetic. Her canvas is the B&B itself, a rambling arcadia of grottos, domes, patios, terraces, and blooming patches evolving across an entire square block. Original artworks and oddities cover the walls, and a 24-hour coffee alcove offers the local Big Bend java. Rooms open onto a massive covered garden where Thayer grows flowers, vegetables, and herbs year round, much of it featured each morning in Thayer’s delectable (and complimentary) breakfasts. Remarkably, most of the labyrinthine structure is constructed from papercrete, an adobe-like building material. “At first, we built with adobe, wanting to use local and natural materials,” Thayer explains. $110/night. 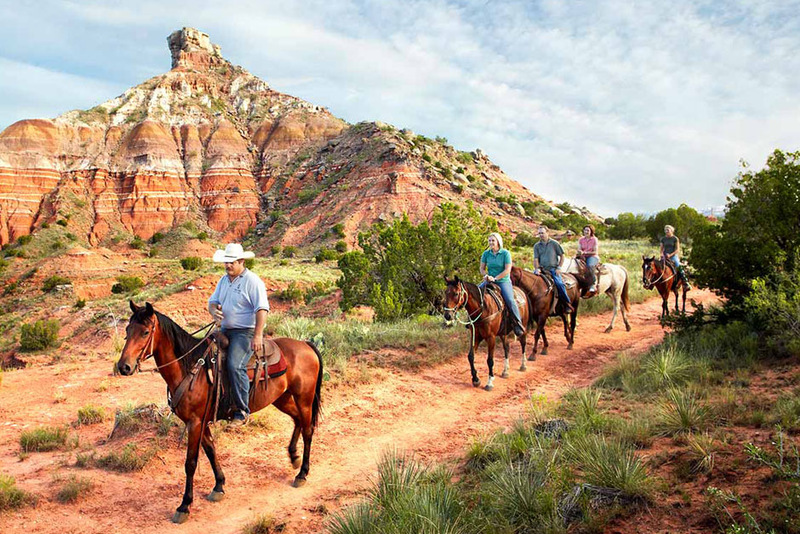 Palo Duro Canyon State Park, 11450 Park Road 5, Canyon. 806/488-2227. Wake up to a sweet breeze, birdsong, and a dizzy, cliff-hanging view of the second-largest canyon in the country after an overnight in Palo Duro Canyon State Park’s Goodnight Cabin. Constructed from the surrounding rock along a slender edge of the canyon’s lip, the cabin is often cited as having the best view in the entire state park system. It’s one of seven cabins located in the park, all built by Civilian Conservation Corps crews in the early 1930s. Franklin D. Roosevelt created the CCC in 1933, putting many Americans back to work on conservation projects like Palo Duro Canyon State Park, which opened to the public in 1934. $105-$140/night. 1 Hot Springs Road, Presidio. 432/229-4165. A far-flung sanctuary tucked into a rugged canyon between the Chinati Mountains and the Rio Grande, this remote resort offers a funky, handmade aesthetic surrounded by Big Bend wilderness. It’s an invitation to turn off your cellphones (they won’t work here) and revel in natural spring-fed hot tubs, homey cabins, overnight camping, and a relaxed atmosphere. The outdoor hot pool, deep enough for a seated, full-body soak and at just the right temperature for long-term lounging, provides the consummate, late-night bliss. Early risers often have the pool to themselves, along with filtered sunlight through cottonwoods and a breathtaking view of the Sierra Madres. Brisk desert nights make Chinati Hot Springs a destination for hot-tubbers year-round, and the addition of a cold pool (open March through October), perched high above the canyon, transforms the summer heat like an afternoon at the beach. Rates start at $300/night. 11222 Schuster Road, Round Top.